Abstract: Lumbar epidural steroid injections (LESIs) are commonly used for managing lower back pain (LBP) and radicular pain. LESIs are generally considered safe with only rare serious complication. One very rare complication that is frequently cited in the literature is adhesive arachnoiditis. However, a literature search failed to detect even one published manuscript, clearly documenting LESI induced arachnoiditis. This article presents two patients who received a transforaminal L5–S1 and two L3–L4 interlaminar LESIs. Although the presented patients developed clear radiological (MRI) findings of arachnoiditis, they were not accompanied by any improvement or deterioration in their clinical condition. The article also reviews the literature on the prevalence, pathogenesis, diagnosis, and clinical features of adhesive arachnoiditis. 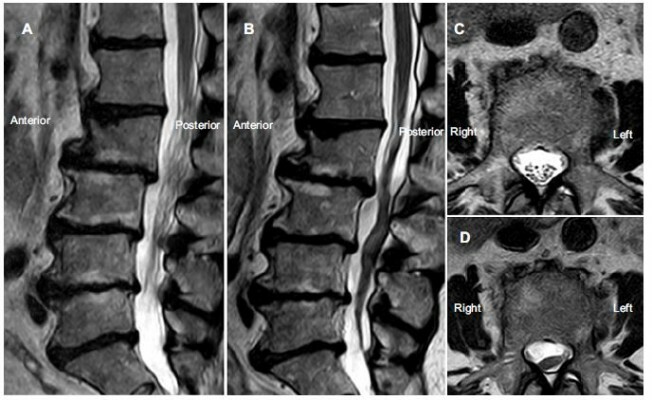 Literature suggests that adhesive arachnoiditis following LESIs is a rare entity, which – as seen in our patients – has clear radiological characteristics but uncertain pathogenesis. It has a large spectrum of clinical presentation, ranging from an incidental finding to a serious neurological sequela. In at least some patients with adhesive arachnoiditis following LESI, the radiological and clinical findings may fail to correlate with each other. In light of the fact that LESI is one of the most commonly performed procedures for managing LBP, clinicians should be aware of this rare yet existing entity.